Have you ever thought how effective your car keys could be as a cheap burglar alarm? We have all set off by mistake our car alarm system when we accidentally push the orange panic button, it will get your attention... you may want to consider keeping your car keys by your bedside table. It will for sure get your neighbors and the burglar's attention. The biggest advantage would be no extra expense... you keep your car keys somewhere, why not on your bedside table? The biggest disadvantage of course, would be waking your neighbors if you accidentally hit the panic button reaching for a glass of water in the middle of the night... but it's something to consider. 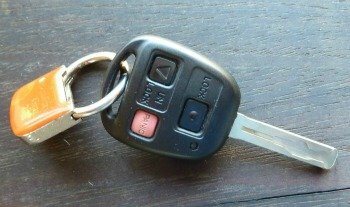 This idea could also work for travelers using the car key for your rental car... if it's outside your motel room. For the smart phone aficionados out there, you can program your smart phone to turn on the lights... that would certainly be a quiet but effective way to deter an intruder or a perceived intruder without waking your neighbors. The advantage of turning on the lights is also no added expense if you have a smart phone capable of doing so... this would let me out, I can barely retrieve email on my smartphone. The disadvantage of using the smart phone, would be fumbling around trying to find the right app button to hit while imagining Freddy Krueger being in your bedroom. Both the car keys and turning on your lights... may be effective alternatives if you are uncomfortable with firearms in your home... that is a personal preference, and you know what's right for you. If this ideas appeal to you give it a try... all you can do is drop in popularity with your neighbors if you hit the panic button on your car keys every time you hear a noise in the middle of the night. I would like to give credit to a friend who emailed this idea to me and the following webpage after a little online research...21 things a burglar will not tell you...the car key tip is at the bottom of the page... you can pick up some extra tips before then... some will only increase your paranoia...but I think I'll be reluctant to posting when I'm on vacation on Facebook. Hope this tip helps someone.